The subtly sweet, cozy, comforting scent of milk is a prized note in perfumes. Not only does it create a regression to childhood, welcome solace, but it enhances floral components and matches the sweeter elements really well. White florals and classical chypres often exhibit "milky" notes, due to added lactones, components whose name derives indeed from the Latin for milk; this is because in nature tuberose, jasmine and gardenia do contain lactones among hundreds of other molecules in their chemical makeup. And so do certain fruits which find themselves recreated in fruity chypres, such as plum, peach and apricot. Their infamous skin compatibility (bordering on the naughtily cuddly) isn't such a mystery; our bodies decompose proteins breaking them up in analogous materials, therefore lactones stick well on skin. The recent rise of the gourmand fragrances sub-group (classified within the Oriental fragrance family) exhibited lots of fragrances that take milk notes as a departing point: either as wholesome as milk itself (notably in Matin Calin by Compotoir Sud Pacifique) or reminding us of milky desserts, such as rice pudding (as in Kenzo Amour), the condensed milk used in sweet tea (Jo Malone Tea Collection Sweet Milk), or crocus-tinged milk puddings (L'Artisan Parfumeur Saffran Troublant). Retro and vintage fragrances are often described as "lactonic" when they exhibit milky facets, in contrast to contemporary fragrances under the gourmet umbrella; that's because lactonic although derivative of the Latin word for milk (lac, hence lacto- etc.) is a very specific perfumery jargon term denoting the conscious use of lactones, which was especially common in older fragrances. Lactones are cyclic esters uniting an alcohol group and a carboxylic group in the same molecule. The most usual lactones used are peach lactone (which has a milky peachy underone like in Caron's Fleurs de Rocaille) or milk lactone (Mugler's Dis-Moi Mirror has it). You can find lactones in infamous examples such as Le Feu d'Issey or Rush by Gucci. An unusual lactone emerging in a contemporary perfume is massoia lactone in Santal Massoia by Hermes., but the evocation of sandalwood and fig sap is possible because the materials themselves possess a milky facet. Although milky notes smell similar to the drinkable variety, in reality the actual nourishing substance isn't used. Milky notes are rendered through illusion, via other materials, such as vanilla or sandalwood very often (as in Santal Blanc by Serge Lutens). These materials naturally have a "creamy" facet, a smooth, sweetish quality about them which can be interpreted as "milky" in compositions. Other materials such as musk from angelica or the resin benzoin have a fluffy ambience which can come across as milky in the right context. The use of lactones (see above) is a shortcut into putting a milk note into a perfume: the effect can be creamier or peachier or woodier depending on the calibrating of proportion and context. The effect of lactones into boosting the creamy facets of white flowers is the main reason why they were used so frequently in the past. Milky notes seem to hit upon a sensitive nerve in perfume lovers and consumers in general. Almost as if going on a Jungian archetype they evoke a sense of fulfilment, sustenance of the body and the soul, a comforting elation that pampers the emotions when in stress. The popularity of milky notes is only set to rise as the times get tougher. I've always been interested in Jo Malone Sweet Milk, even though the idea of something overly sweet in fragrance is nauseating to me! I thought of a long ago favorite of mine when I read this post: L'occitane Milk Hand Cream! And Muglers don't always work on me, but I am very interested now in Dis Moi, Miroir. Thanks! One of my favorite scents was Bvlgari's Omnia, such a lovely use of spices and milk. Very informative post as usual. The disappearance of the compellingly weird Feu d'Issey can only be lamented. I don't know if it's lactones, but I love the creaminess of Calandre in an otherwise rosy and slightly metallic environment (and for once, this one seems to have been reissued, at least in Paris). And I'd also mention vintage (sadly, only vintage) Ubar, where the liters of milk balanced the floriental explosion. @nofixedstars, sometimes I think lactonic notes come off as buttery more than milky. If you've ever smelled a butter note in a perfume, that might have been lactones. not a huge milky note fan, but do enjoy saffran troublant, rush and le feu d'issey. still have trouble loving santal blanc - it just doesn't ring my chimes for some reason. and while the saffran may be troublant, that photograph of the boy is even more so! do the parents not realize how violent that movie is? the kid is super ute, but that's a helluva a model to use for a costume. yikes! the L'Occitane product sounds good! I generally like the approach of that line and some of their fragrances too. I believe Calandre owes that impression to something that has to do with the rose and/or sandalwood. I don't recall it having the old lactones of chypres, but it's been a while since I last smelled it. if you can smell milk, you can smell milky notes. What is not so explicitly stated is that usually the milky note is allied to a peachiness, like a peach milkshake or something. Other times it's butyric (see my entry on those terms on the right hand corner: creamy, lactonic, butyric; the differences can be subtle but poignant). Above all, don't despair; we all have more or less the same nose, it's just the mental pathway that gets exercised more. Trust your own and you'll be there. I forgot to mention that the metallic element in Calandre is due to rose oxides. Yes, as you say. Butyric is closely related to lactonic/creamy/milky. Good thinking! To be honest, I find the contrast between Alex and the "got milk" campaign we all know to be at odds, the wholesomeness and the acro juxtaposed, and it pleases me no end. As soon as I laid eyes on this, I knew I had to use it! Personally I don't think it's a simple photo taken by parents on Halloween or something (even if they were thinking they were making an artistic statement); it's a professional shoot to my eye. 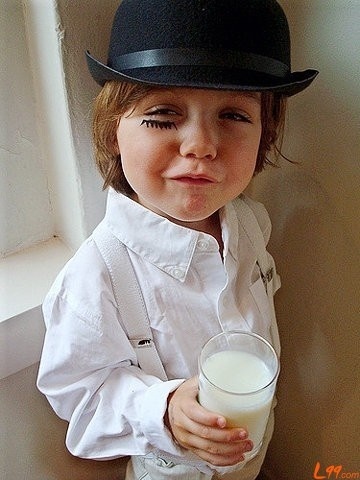 If you notice the shot, it's not on eye level, but slightly on an angle, same as with movies, giving the head a bigger dimension and the milk a smaller one, thereby (in my mind's eye) making the violence and mischief implied by the kid's smilkey eyes overcome the innocence of milk (and of childhood). Of course your argument on why the parents didn't object to their child being used in a violent reference still stands. I have no answer to that, apart that maybe they first explained some things to him, then agreed to the shoot. Honestly and to go in more depth, I found Clockwork Orange made a case for the dead end of the rationalization of violence and of the futility of "correcting" it in the conventional ways. Where does ethical intervention begin and where does manipulation and mind control begin, sorta. It does require a mature audience, to be sure, otherwise (like with Fight Club more recently) one might be temped to take this at its fascistic face value and imitate rather than think. Typos, typos....meant "smiley" eyes......nah, I don't think that's correct either. Strike that out. Smirking eyes, maybe. Lostmarch's Lann-Ael and Lollia's Wish are two milky comfort scents that I've sampled. Both are also madly sweet, like the milk you might have loved finding at the bottom of your cereal bowl as a kid. Maybe that childhood memory contributes to the comfort factor. Santal Majuscule and Amaranthine come to mind. I normally struggle with rose and white florals (that doesn't leave much), but their treatment in these scents is delicious and strangely comforting. Love the pic by the way! Reminds me of friend's child who used to go with me on the annual Zombie Walk. I place Clockwork Orange up there with movies like Brazil- disturbing, depressing, enlightening and can only be watched in its entirety once! I remember egoist striking me as overly lactonic and although I generally like the nuance it puts me off in the specific context. I could be wrong though and maybe some other aromachemical family is responsible. Very nice and informative article, Elena! I was never a big fan of milky perfumes but there is always an exception. For me this exception is Simply, Clinique (discontinued or not?). An unusual, creamy and warm composition based in soya beans and soya milk. Most people I know didn't like it because they found it weird. According to fragrantica it belongs to oriental fragrances (why?) but for me it's like a memory of my mother's hug when I was an infant. My favorite in this category is the long-discontinued Mukki by Fresh. Haven't seen that one around since the late 1990s, but I sure enjoyed it while it lasted. Fresh also had a wonderful line of Lait lotions with apricot, chocolate, and milk (milk being redundant -- but it was called Lait Lait, if I recall). They were all divine and came in really heavy glass bottles shaped like old school milk bottles. Wonderful. Nowadays, the only creamy fragrance I wear is Safran Troublant. I think it's scrumptious. Great article! I love lactone notes in perfumes.Two of my favorites are the almond milk note in Neela Vermiere's Mohur and the creamy lactonic note with sandalwood and cardamom in Olfactive Studio's Lumiere Blanche.I also have some massoia bark essential oil and I can definitely detect the lactones which have a creamy coconut like effect. In fact Lann Ael as I recall it has a cereal impression down pat! You're absolutely right. the creaminess of sandalwood for one and of white flowers for the other; you do have your lactonic notes sorted out amazingly actually. And such great fragrances too! As to Brazil, I consider it a masterpiece. In 20 years' time it will be taught in film school, just like Kubrick is. exactly, Simply belongs to this category! Good memory and I can see how you'd like it. Yes, it is discontinued for some years now. I think this cereal-nutty-milky thing (Hilfiger's own fronted by Beyonce I recall had a similar direction) was on the vanguard, but niche hadn't caught on as much then and people of mainstream experience found them weird, so they tanked. All nutty, foody fragrances belong in the oriental group by default, as they form the gourmand subcategory within the family. Please consult intro article on gourmand fragrances. Lactonic notes however can be found in other families as well (chypres, florals), it's a matter of perfume structure and proportion that makes the difference. Safran Troublant is as good as an Indian dessert. Spicy, smooth, sweet, filling but not too filling, if you know what I mean. i think you're probably right about it being a professional shoot. i appreciate the juxtaposition too, but still find it a little shocking for some reason (and i'm no prude). i get the play on innocence/violence and the tweaking of our standard use of milk as a symbol of wholesomeness and purity... maybe it's the use of a child that age... dunno. it's been a long time since i've seen the flick, but much of its imagery stuck with me... hence my recognizing the visual reference. yes, there was a ton of social commentary in it - and your take on it is no doubt correct. it wouldn't surprise me if it were still viable today. oh, and the kid is definitely smirky! looks like a little rascal. Yeah, you can say that again; the imagery sticks and it's not pleasant, feel good imagery at all. Nor is American Psycho, as discussed on another post, so be prepared if going that route; it's worth it, but it sticks. Though I believe that NO horror imagery sticks as powerfully as the original Exorcist film, with its absolutely c-h-i-l-l-i-n-g (to me) Greek voiceover standing for the priest's ailing mother; most scary thing on the face of the earth and a truly masterful glimpse on the mercilessness of evil who can't spare even an innocent child...Digressing but...I had first watched this when I was 13 (Greek parental guidance limits are 13 and then 18, there's no in-between and I did look more grown up than my age anyway which probably got me into more mature things than I should have) and even subsequent viewings haven't quite "cured" me of its strange fascination; I self-medicate masochistically by re-watching it every 7-8 years, but it always curdles the blood all the same; if an innocent child is doomed, then who is safe? I call it one of my cinematic scars. But one I can't take my eyes off or resist the urge to scratch. Friedkin would be proud. Little rascal sounds like bull's eye; he knows he's being naughty!